Lydia is the favorite child of Marilyn and James Lee, and her parents are determined that Lydia will fulfill the dreams they were unable to pursue. When Lydia’s body is found in the local lake, the delicate balancing act that has been keeping the Lee family together tumbles into chaos, forcing them to confront the long-kept secrets that have been slowly pulling them apart. James, consumed by guilt, sets out on a reckless path that may destroy his marriage. Marilyn, devastated and vengeful, is determined to find a responsible party, no matter what the cost. Lydia’s older brother, Nathan, is certain that the neighborhood bad boy Jack is somehow involved. But it’s the youngest of the family—Hannah—who observes far more than anyone realizes and who may be the only one who knows the truth about what happened. 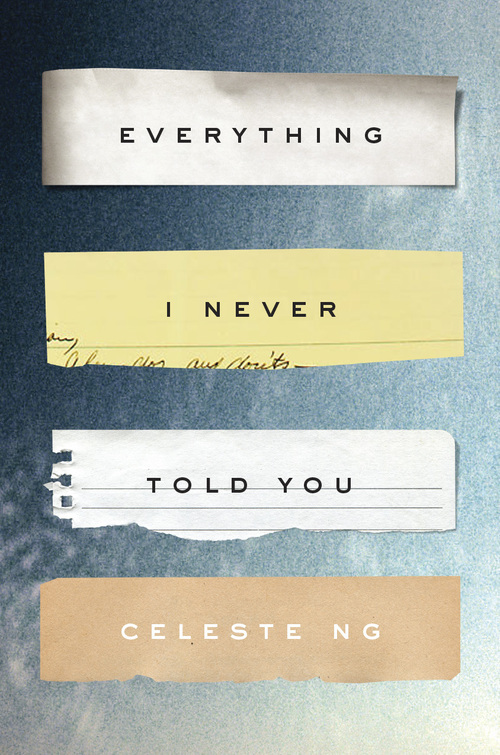 Celeste is giving away a signed copy of Everything I Never Told You to one commenter (details at the end of this post). Thank you so much for being here, Celeste! Tell us a bit about the story behind the story: What inspired you to write Everything I Never Told You? How long did it take and what was the journey like along the way? The seed of the story came from an anecdote my husband told me: when he was a boy, a schoolmate had pushed his own little sister into a lake. She was rescued, but I kept thinking about what that experience had been like for the sister, what kind of family dynamic could have led to this—and what that dynamic might have been like afterwards!—and, of course, what would have happened in this family if the sister had not been saved. The story morphed into something quite different—in my novel, Lydia is a teenager, for starters—but it all sprang from that image of a girl falling into the water, and the family dynamics that might have led to this. I started the novel in 2006 and it sold in 2012—in the six years in between, I wrote four drafts, worked a number of odd (and mostly ill-paying) jobs, and had a son. So it’s been a long path, and I’m so happy to have this book out in the world at last. How did you come to realize this story would be told in omniscient voice? Why does it work for this story (and did it present any challenges)? Originally, the novel was written in the close third person, and I had five—five!—point of view characters. With so many points of view, though, I kept having to show a scene twice, to show how different characters experienced it or interpreted it in different ways. I needed something to help pull all the strands of the story together, and I eventually realized I needed an omniscient narrator. I had never written in the omniscient point of view before—in fact, I was more than a little scared to try it. But the story is all about secrets and misunderstandings, as well as the way the past and the present are inextricably linked, and the omniscient narrator can help make those connections in a way no other point of view can. I spent a lot of time looking at examples of novels that use the omniscient POV—Ann Patchett’s Bel Canto, Edward P. Jones’ The Known World, Arundhati Roy’s The God of Small Things—to figure out how to do it. It’s tricky, but actually I think omniscient POV is used in contemporary fiction more often than we realize it is and maybe less often than it should be. Speaking of first lines: Lydia is dead. But they don’t know this yet . . . What an amazing first line; I’m blown away by it. Was this always your first line, or did it come to you later on in the process? Can you tell us about your decision to start the book here. Thank you! The original first line, in the first few drafts, was quite different—“At first, they don’t know where Lydia has gone”—and Lydia’s death isn’t revealed until a few chapters in. You can see it’s got a very different tone, withholding information where the final first line is totally upfront. In the final draft, I realized that the reader really deserved to know what happened at the very beginning. That way, the focus isn’t ever on whether she’s dead or not, it’s on why (and how) this happened. Earlier this year, well after the book was done, I was on a panel at AWP called “From Thesis to Book,” and in preparing for that panel, I had to look back at my old drafts. I found that in the very, very first proto-draft, I’d actually had a prologue that began, “Lydia dies: that’s the first thing.” That prologue got cut before the draft was even finished—I’m generally against prologues—but it’s interesting to me that I ended up going back to that first impulse, to announce Lydia’s death right off the bat. Sometimes I think our original instincts are better than we give ourselves credit for. I really enjoyed Huffington Post your essay from 2009, Why I Don’t Want to Be the Next Amy Tan. It’s now five years later and your novel’s already getting amazing reviews. Do you feel the industry has made any progress in terms of comparing minority writers only to other minority writers? How are we doing better? How can we improve? I do feel the industry has made a lot of progress, for a few reasons. First, we’re more aware of the issue. Look at the recent #WeNeedDiverseBooks campaign: I think more and more people are aware that we gain something by having more diverse authors and books that describe more diverse experiences. Being aware of the issue, and actively talking about it, is an important first step in addressing it. And finally, what is your advice for aspiring writers? Read a lot, and make a point of trying things you wouldn’t ordinarily pick up—you don’t have to finish, just try it. Write a lot, without worrying whether it’s going to get published—again, you don’t have to finish, just try it. Like anything, writing takes a lot of practice: this is your equivalent of swimming laps or doing arpeggios. Learn to both silence your inner critic (when you’re writing) and to turn it back on (when you’re done). Most of all, try to be open to all of the experiences—large and small—that make up life, and be prepared to find wonder and meaning in anything. Readers, what new experiences make you wonder and inspire you in your writing? GIVEAWAY! Comment on this post by noon EST on Friday, August 8st, to enter to win a signed copy of Everything I Never Told You (U.S. only, please). Follow The Debutante Ball on Facebook and Twitter for extra entries—just mention that you did so in your comments. We’ll choose and contact the winner on Friday. Good luck! Celeste Ng’s stories and essays have appeared in One Story, Five Chapters, Gulf Coast, the Bellevue Literary Review, The Millions, The Huffington Post, and elsewhere, and she has been awarded the Pushcart Prize, the Hopwood Award, and a scholarship to the Bread Loaf Writers’ Conference. She earned an MFA from the University of Michigan (now the Helen Zell Writers’ Program at the University of Michigan) and has taught writing at the University of Michigan and Grub Street in Boston. She lives in Cambridge, Massachusetts. To learn more about her and her work, visit celesteng.com or follow her on Twitter (@pronounced_ing). This sounds beautiful. I’m going to add it to my TBR list now! Reading this interview reminded me of the wonderful Ordinary People by Judith Guest. It’s another story with a look inside family dynamics and the effects of tragedy on that spiderweb of relationships. I can’t wait to read this one. I follow on twitter and Facebook. I’m sitting in small town Ohio, staring at the lake, and I think I need to get this book. Don’t let Audrey turn her back on Vivi. Welcome, Celeste! Thanks for visiting us! Your novel sounds wonderful. Thanks for posting with us today, Celeste! Yay, a fellow Wolverine! Best wishes (although it sounds like you’re doing fine 🙂 ). Oh I would LOVE to read this book! Celeste has been on my radar both since hearing about her book in this month’s Poets & Writers but also, because I LOVED her NPR commentary on being a closeted fan of the Sweet Valley High series (ME TOO!) Would love to win a copy! And I just started following DB on Twitter too — what a great resource! Congratulations on the book and welcome to the ball! I never really thought about it that way before. Thanks for the insight! Congrats on your debut. I have heard great things about it and am looking forward to reading it. I must also comment on what you said about minority writers. As part African American I often get asked about my stories and people just assume that all I write is African American characters. When I tell them that my characters are very diverse I get that “how can you write that look”. It is true that we all seem to get put in the same basket no matter what we do. One can only hope and keep it moving! Really good interview. Congratulations, Celeste, and I look forward to reading this book! So thrilled to have you at the Ball, Celeste! Thanks for a great interview and congrats again on your launch!